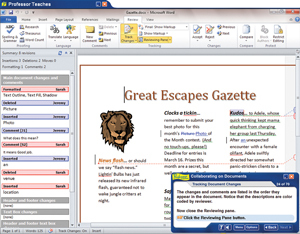 Professor Teaches Office 2010 helps you get the most out of Microsoft Office 2010. 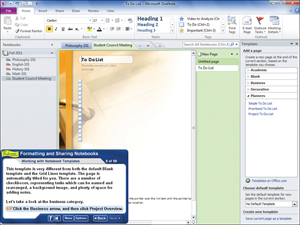 This ten-program Tutorial Set includes over 500 lessons for Word, Excel, PowerPoint, Outlook, Access, and Publisher 2010, plus advanced courses for Word, Excel and PowerPoint. Professor Teaches®, offers the most realistic, interactive, and complete training for Microsoft Office 2010! 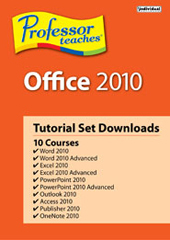 Download the product and start learning Microsoft Office 2010 today! Learn how to organize, search, and share your ideas and class projects with OneNote 2010. Discover how to create professional-looking documents quickly with Word 2010. Learn to use the features of Microsoft Office 2010 to quickly create great-looking documents, spreadsheets, and presentations. Take advantage of powerful new tools for collecting, analyzing, and sharing information. With this ten-program tutorial set you can build your skills quickly and easily, and unlock the power of Office to improve your productivity at home or work. What Are the Benefits of Learning Microsoft Office 2010?